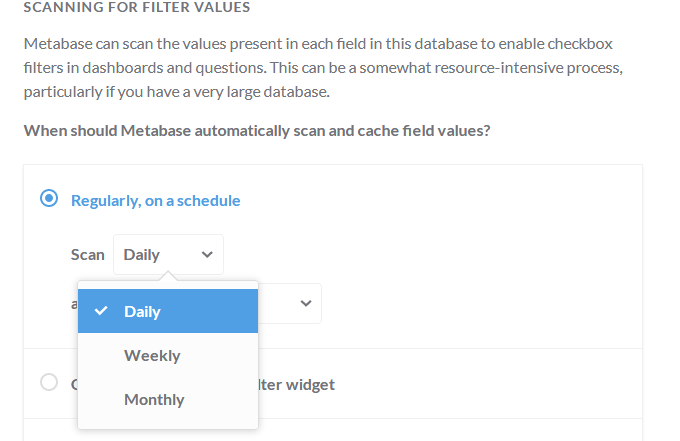 I’m trying to figure when the cached values used in field filters get refreshed. From my looking at the source code here, my understanding is that field values are re-cached every day at midnight. Is this understanding correct, or am I missing something? I had a quick look in the API and couldn’t see a way to do the update programatically. Bit of a surprise, so maybe I’ve missed something. I can’t seem to find it in the admin view – are you also using 0.28.1? If so, which panel is this on? In DAtabases, select the database thenyou have to select the large database option and save. Extra options appear. oh wow – that’s awesome! Thank you!